I've been told I look like a little evacuee in this outfit, I'm not sure if that's true but I definitely feel like a little girl when I'm wearing it. Just like everyone else and their dog, I've been in love with peter pan collars this season and this dress is perfect. I don't often wear all black so I've mostly been pairing this dress with different jumpers and flopping that lovely collar over the top. I almost returned this jumper when I bought it back at the beginning of autumn because I don't usually go for brown, but I'm so glad I kept it, it's been one of my favourite pieces to wear this autumn/winter. The pattern is pretty enough alone, but those elbow patches make it even better. I had to add the patterned socks, simply because I've been finding it impossible not to add a pair of socks to every outfit recently! you look adorable and i agree with heather, your hair's lovely. So cute, you look like the girl from bedknobs and broomsticks in it! i saw the first picture and i loved what you are wearing and THEN i saw the last picture and i adore it..elbow patches are the best thing ever. you look beautiful. glad you kept this amazing sweater! I've always been a fan of peter pan collars, so sweet. love that little sweater too. I love this! great way to wear a peter pan collar dress. I think i will have to try this too. What a gorgeous outfit! I love everything about it! Definitely does have a "little evacuee" flavour...but just adds to the chic and adorable!!! 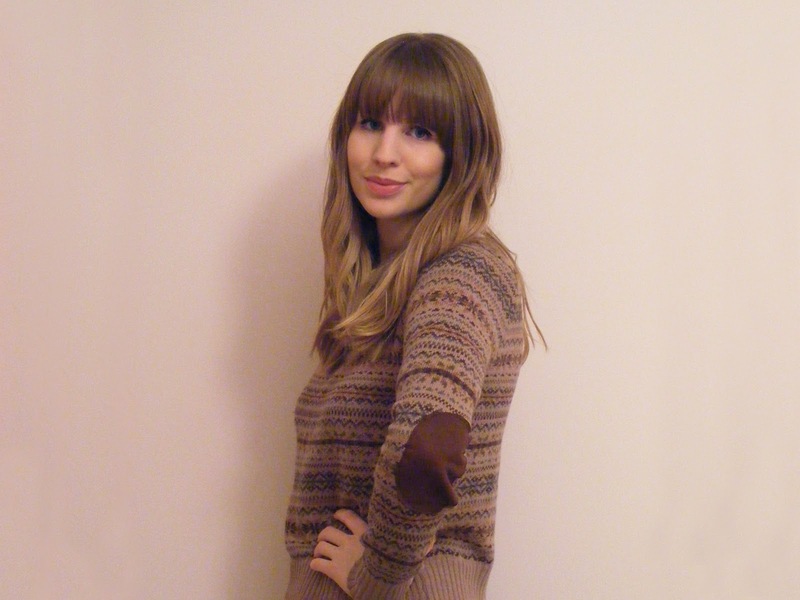 Elbow patches are one of my very favourite fashion details. Gorgeous outfit! Really cute. Great blog you have here! I am so glad you are back to posting outfits! Loving the asos dress, it seems to be so versatile. I am seriously considering getting one. You look like Alexa Chung, I'm sure you get told that all the time! Thank you so much for your lovely comment,it means a lot. I totally love your blog,and now I´m following you. Very nice pictures, I love this outfit ! Your hair is beautiful, you look pretty ! The peter pan collar is adorable! i've just seen ur pic, nd Alexa Chung's style came to my head. i love that jumper so much. More is less! Great outfit, classic, but still chic!